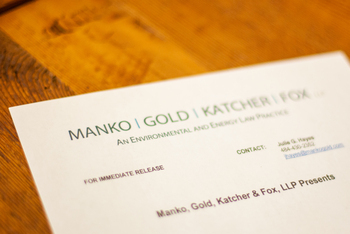 Philadelphia, PA (August 3, 2009) – Manko, Gold, Katcher & Fox, LLP (MGKF), an environmental, energy and land use law firm, is pleased to announce that 11 of the firm's attorneys have been recognized by The Best Lawyers in America® 2010 (Copyright 2010 by Woodward/White, Inc. of Aiken, S.C.) for their contribution to Environmental Law. Included in the list of The Best Lawyers in America are Joseph M. Manko, Marc E. Gold, Bruce S. Katcher, Robert D. Fox, Bart E. Cassidy, Brenda Hustis Gotanda, Jill Hyman Kaplan, Michael M. Meloy, Jonathan E. Rinde, Jonathan H. Spergel, and Neil S. Witkes. Gold has been included for 20 years; Manko, Katcher and Fox have been included for more than 10 years.